I flew a sprayer out of Carnegie – an Ag Cat – one of two owned and operated by one Paul Leonard – from a short dirt air strip owned by the Andrews family, in ’65. Mr. Andrews, the patriarch, who was quite elderly, even then, had a steel barn on the strip (which was on his property) in which he kept the material we applied, selling such to the cotton and peanut farmers we serviced, and more or less acting as the agent/contact for the operation, keeping track of whose farms we were to spray (or dust, in the case of peanuts, but spraying cotton being most of our business, with a bit of soy bean spraying, at times) on a given day. Mr. Andrews grew cotton himself at more than one place, one of his farms called the Bell Farm. There was a black family who lived adjacent to the airstrip. The teen age son acted as the loader for our operation – which was lot of work – his dad giving him a hand or filling in for him occasionally. I recall that Mr. Andrews died not long after the summer season I spent in Carnegie, perhaps only a year or so later, so I was informed by one of his family members at the time. What I recall about Carnegie was that there was a crossroads, more or less at which stood a wood frame Baptist church, on the north side of the east/west road, and an old building across the street, one not in use, as I remember. Driving to the north took one to Cuthbert, the south to Edison. I stayed in a motel in the former, one on the north side of the road leading to downtown. 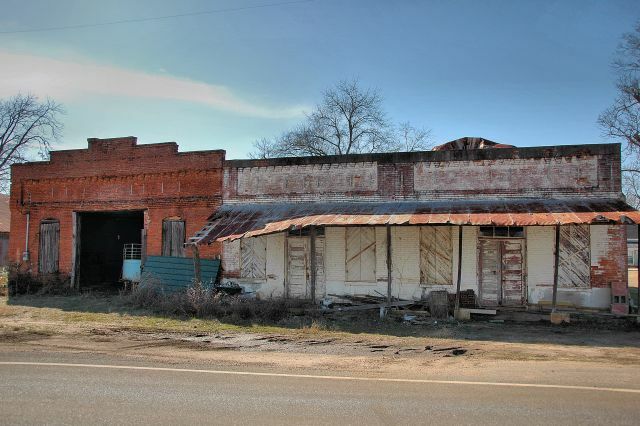 I lived on Brunswick stew, BQ sandwiches, and Bud, all provided by a man who owned a tavern on the south side of Cuthbert’s town square, a man who called everyone who came into his place – male or female – “Darlin’”, or “Honey”. It seems only a short time ago that I spent that summer in Carnegie and Cuthbert, but fifty years is a long time.